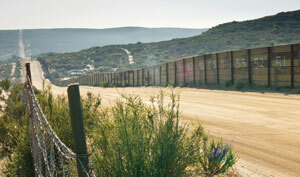 In January 2004 the US-VISIT biometric border crossing system went live. The program was collecting two-fingerprints for comparison against a watch list of known criminals and terrorists to make sure they weren’t allowed into the U.S. It is one of the first biometric border crossing systems in the world and serves as a model to other countries as they roll out similar systems. The U.S. Department of Homeland Security’s US-VISIT, which came out of the Sept. 11, 2001 terrorist attacks, has changed, upgraded and adapted in the past eight years. Still more changes are on the horizon including: greater interoperability with other U.S. agencies, the addition of multi-modal biometrics for expedited screening, and refinements on the existing exit system. Since upgrading from two-prints to 10-prints in 2008 a focus has been on interoperability with other agency databases, says Robert Mocny, director of the US-VISIT program. The program is fully interoperable with the U.S. Justice Department’s biometric database, checking fingerprints of individuals at border checkpoints in real time and receiving responses in 13-seconds. “This enables Customs and Border Protection access to millions of records in the criminal master files,” he adds. Fingerprint biometrics will be the standard for US-VISIT, though the agency will add iris to the mix, Mocny says. In 2010, Homeland Security piloted iris scanning at a border patrol station in McAllen, Texas, checking immigrants against a watch list as they crossed the border. The success of this pilot is expected to lead to iris biometric integration into Global Entry kiosks. Global Entry is an international expedited border-crossing program that enables U.S. citizens to use kiosks when entering the country. Travelers have to enroll in the program, pay a fee and undergo a background check to participate. “We’ll always keep fingerprint but from a transactional point of view iris is much better,” Mocny says. There’s the possibility facial recognition could be added down the line as well. While the biometric screening process has been in place for some time, the exit component to US-VISIT has been tougher to tackle. Homeland Security wanted airlines to collect the biometric departure information, but the companies refused and eventually were able to dissuade the agency. The biometric portion of exit has not been fulfilled, but the agency has taken other measures to determine if individuals have overstayed and track them down, Mocny says. Airlines still collect biographical data from travelers and provide that to Homeland Security. That information combined with the entry data and other data sets enables the US-VISIT office to determine whether someone is a threat. 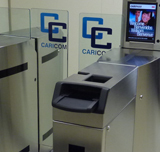 Since the US-VISIT program was one of the first biometric border crossing systems deployed, officials have worked with other countries considering similar systems. China visited the US-VISIT office earlier this year to discuss biometric borders and the European Union is also rolling out a US-VISIT type of system, Mocny explains. There’s also the Five Country Conference–the UK, U.S., New Zealand, Australia and Canada–who have agreed to share immigration data and develop interoperable systems. On February 6, 2012, subject “X” arrived at the George Bush Intercontinental Airport in Houston after a trip to Panama and applied for admission as a returning lawful permanent resident. He presented a valid Mexican passport and a valid U.S. Permanent Resident Card. After his fingerprints captured in the system, he was referred to secondary inspection for being a match against the US-VISIT Watch List. During secondary inspection, it was discovered the subject had been arrested in Texas for drug possession, and was determined to be inadmissible into the United States due to a controlled substance conviction. This case highlights the value of having the availability to search the FBI’s Criminal Master File which returns a response within 15 seconds. Without a positive biometric identification match, “X” would have possibly entered the U.S. without question. On November 30, 2011, Australia submitted to US-VISIT the fingerprints of subject “V,” who was seeking refugee protection. The fingerprints were a positive match to an encounter in US-VISIT database. After further analysis, it was revealed that subject “V” was born in Egypt yet claiming Australian citizenship. “V” was in possession of a valid passport issued by Australia, but it was suspected that it was issued in error and obtained by using fraudulent claims and documentation. It was also discovered subject “V” was connected to multiple aliases, social security numbers, and dates of birth. US-VISIT assisted Australia in confirming his true identity.